A magnetic geophysical survey comprising measurements of the local magnetic field using a magnetometer or gradiometer can detect variations of environmental, engineering and archaeological significance. By commisioning a magnetic survey using a magnetometer or gradiometer it is possible to pinpoint areas where the magnetic field is anomalous with respect to the regional average. These magnetic anomalies can relate to buried targets such as pipes, drums, foundations, tanks and also larger scale geological changes. At the environmental and engineering geophysics level, measurements of the magnetic field gradient taken during a gradiometer survey have a high senstivity to magnetic targets in the upper few meters of the sub-surface. This fact makes gradiometer surveys particularly applicable to surveys on brownfield development sites where the high resolution of the surveys can pick out small targets in made ground. Magnetometer and gradiometer survey instruments have various operational differences which affect their sensitivity and noise rejection thresholds and the type of survey for which they are suitable. In the image to the right we are using a caesium vapour magnetometer to locate buried drums and waste on an old landfill site. Note the differential GPS antenna behind the operator. This set-up allows us to survey a site without setting out survey lines, allows rapid data collection with sub-meter positioning. Magnetic anomalies found during processing of magnetometer and gradiometer surveys can be represented as single profiles or upon highly detailed maps superimposed upon a CAD-based topographic survey. With our interpretation skills we can also estimate target depth and orientation. Below is an example of the type of output we can provide following a magnetic survey. 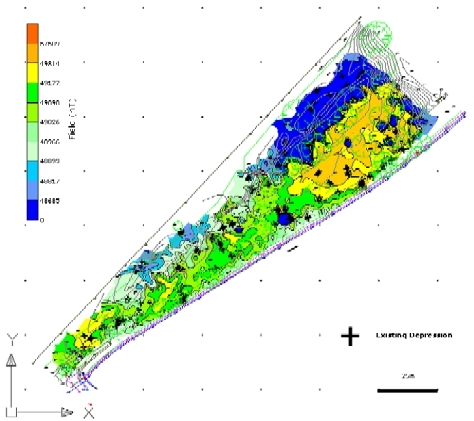 The survey of a former landfill site was completed with a mix of magnetometry and electromagnetic ground conductivity measurements. The magnetometic survey data have been superimposed on a topographic plan of the site.